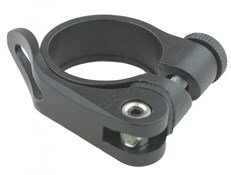 Lightweight MTB seatpost clamp with QR lever fixing. Please Note: Image is for display purposes only. Needed a cheap replacement seatpost clamp what else can I say very good quality for price,well made and without a doubt would buy again no problems with seatpost slipping.